Below is the link of the older version of InstaSize if you wish to download it! :);https://play.google.com/store/apps/details?id=com.jsdev.instasizelegacy;Over 9 million people love InstaSize!! ;One of the Top 10 Instagram Companion Apps;- Mashable.com;One of the Best Apps to Post Rectangle Photos on Instagram;- CNET.com;InstaSize is the easiest and quickest way to post entire photos on Instagram without cropping. 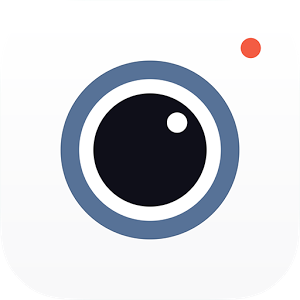 ;GREAT FEATURES;• POST ENTIRE PHOTOS ON INSTAGRAM;Easily import photos from your albums or take a photo directly on Instasize. Edit your photo, hit share and BAM! your photo is ready to share on Instagram. ;• ADD FILTERS, OVERLAYS AND TEXT TO YOUR PICTURES;By using the layers option you can easily add awesome filters, overlays and typography to your photos. ;You can choose from a variety of amazing fonts with the ability to resize and rotate your text! You can also have multiple text layers so that you can have a unique picture! 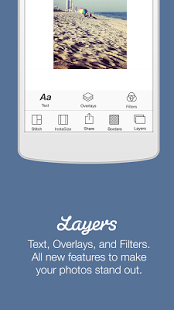 ;We have beautiful packs of filters and overlays! By using one of these great filters and overlays, your picture will truly stand out from the rest! ;• CREATE COLLAGES;Use the Stitch option to create fun collages with our frames. The quickest and easiest way to create a collage for Instagram. Just pick a frame and add your favorite photos. ;• ADD BACKGROUNDS;Add over 40 backgrounds, both patterns and colors, to your photos. ;• AD FREE VERSION;Tired of seeing of ads? Go ahead and upgrade to the ad free version, found in the settings. We promise to remove the ads after you purchase. ;• SHARE TO INSTAGRAM AND OTHERS;After you are done creating your masterpiece, just click the Share button on the menu. Here you will be able to share to Instagram, save to you gallery, Twitter, Facebook and many more. ;• SOCIAL NETWORKING;Follow us on Instagram and Twitter to hear any news or updates about InstaSize. We also like to shout out cool photos so don't forget to use our hashtag, #InstaSize. 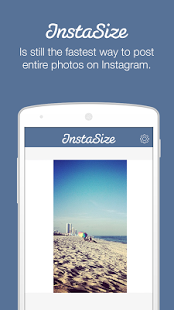 ;Download Instasize today and experience the best Instagram companion app on Android!